I was in Sam’s Club the other night right at closing. While I was standing near the baked goods area, I watched an employee culling the shelves of product that was hitting its expiration date. I thought to myself, if I had shopped there 10 minutes ago, the baked goods would have been considered fine; now it’s considered stale. That got me to thinking about the old Bunny Bread facility at William and Christine St.
My brothers and I were raised on cinnamon sugar peanut butter toast. If we were lucky, we got it made out of raisin bread. It didn’t matter if it was plain white bread or raisin break, it was almost always from the “Used Bread Store,” as we called it. My folks said the bread was perfectly good, just past the sell-by date. They assured us that we were going to eat it up so fast that it wouldn’t have a chance to get stale for real. 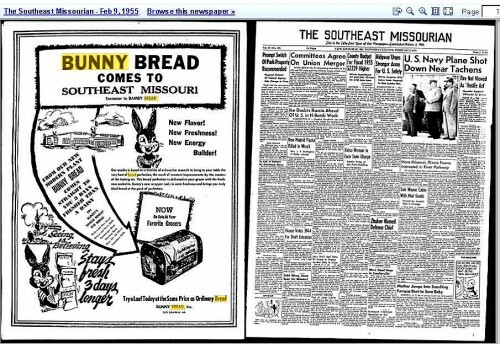 When Raymond Lewis died, his Sept. 25, 2001, obituary in The Southeast Missourian had information I didn’t know about Bunny Bread (previously known as Bamby Bread). In 1925 Raymond Lewis and his two brothers, A.C. and Arnold, launched Lewis Bakeries in Anna, Il., with $300 they borrowed from their mother. Mr. Lewis took over the bakery in 1944 and grew the company into a major regional bakery. In 1950 he originated and copyrighted the name “Bunny” and in 1951 he built a new bakery in Anna. Soon “That’s What I Said, Bunny Bread” and “Get the Rabbit Habit” were heard all over the Heartland. The company is now comprised of seven bakeries selling fresh bread products in 14 states from Michigan to Alabama and from Ohio to Arkansas, and frozen products nationwide. These three girls were going door to door trying to sell Bunny Bread to raise funds for the Teen Age Club. The negative sleeve said it was taken Aug. 24, 1967. This ad showing the history of Cape businesses probably ran at Bunny Bread’s high point. A May 29, 1956, Missourian story announced the start of construction of the building shown above. “The structure, declared cost of which is $21,000, will be 130 feet long by 50 feet wide. Three sides will be concrete block and the front brick. The bakery, 533 Good Hope St., will continue to be used by the firm while the new structure will be used as a loading point for trucks which distribute the products. ” The new building was needed to quarter the company’s fleet of 15 trucks. On Dec. 3, 1992, the other shoe dropped. Bunny Bread Bakeries, which was founded in a log cabin in Anna in 1925, announced it was closing its Anna baking operations. The Cape Girardeau bakery closed in 1988. Loss of population from the area was given as the reason for the restructuring. I’m not sure when the “Used Bread Store” morphed into C.A.P Supplies. My mother would go, or send one of us kids, to the Hart’s used bread store on Kingsway to stock up. 10 loaves at one time, with nine going into the freezer. With 9 kids, it was the only way to go. It was easier to spread peanut butter on a frozen slice. And, the individual slices thawed quickly, especially in a Cape summer before AC! Mrs. Criddle my neighbor worked there for years and I thought she had the best job in the world. My parents were frequent buyers having 9 children. I used to ride my bike down there often to buy a 5 cent leftover fruit pie. His daughter Sandra worked the cash register and generally was a very nice person. Sandra was very gravelly ill and none of us knew the how gravelly until we attended her funeral. We don’t get Bunny Bread down here in Florida, but where ever I hear…”That’s what I said…Bunny Bread” I think of Mr. Cracraft, Sandra and Capaha Park Pool. YouTube has a surprising number of Crusader Rabbit episodes online. I had never heard of the show before. The appetizing aroma, that would spread through out that part of the town, is what I miss the most. “There baking bread again” was often heard or murmured on the lips of people on the side of town. Incidentally Ken, your expression “baked goods” gave me a chuckle has I thought about the immortal line from “American Pie”. I remember when I was in the cub Scouts back in the early 60’s getting to go to the Bunny Bread Bakery that was on the corner of Good Hope and Frederick St. I got to see how the bread was made and the smells were fantastic. I also remember going to the “Bunny Bread Store” with a uncle of mine and he ould sometimes take me and my younger brother and sister to the Bunny Bread Store with him. He would go there and buy bread fro my Great Uncle and Great aunt. So much has changed but not the memories. Thanks Ken for reminding us of the good times. Also, I watched Crusader Rabbitt cartoons every time they were on. I received an email that said that the three girls selling bread were Jane ? from Notre Dame, Lavonda Baker from Central and Pandora Reitzel, another Notre Damer. Hey Bob Ravenstein! Watch it! I was one of those girls. It’s important to fill in the history of Bunny Bread. Hey Patte, Nice bunny outfit. You all were fun to watch! Yes, It was a TV commercial, Bob; therefore, no still pics that I know of. I think all three of us, and I am not even sure who else it was and possibly there was more, were dance students of Jo Ann Stevens. My stepdad Elmo Underwood was the general manager for Bunny Bread for many years. I remember the Good Hope building and the William Street (new building) location. I spent many a long hour “running” a route with him when one of the drivers was sick or on vacation. Loaves of bread came in cardboard boxes then and I remember breaking those boxes down and sorting them for return to the bakery. 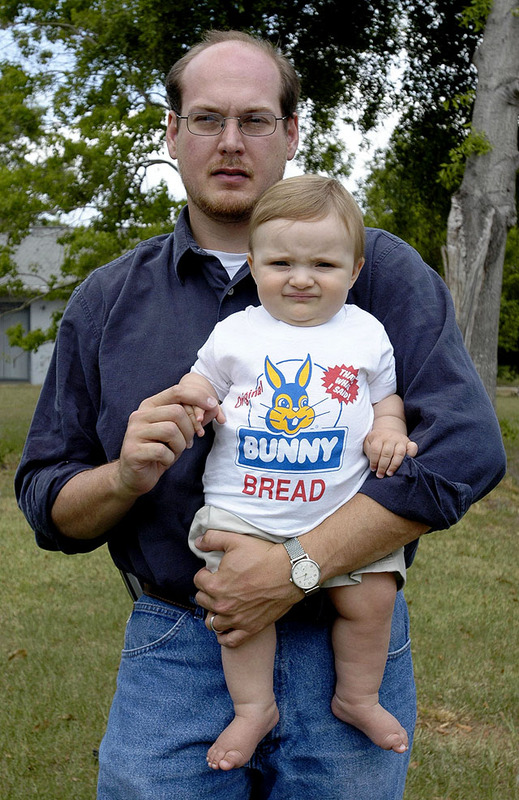 My half-brother Ray and I once made a black and white TV commercial at KFVS studio wearing our Bunny Bread t-shirts. “Get The Rabbit Habit” was another slogan from those days. Grant Holt and Arnold Edwards were two of the delivery drivers I remember. Didn’t know Patricia Shelton Beran was a rabbit girl, however. i remember the bread store running on the weekends making cinnamon rolls,and working the gas station a block away. it killed me to smell it. i was usually starved. getting off the point,i remember terry hopkins and bill jackson being our coaches at the pool. terry lived close to me and is a great guy. he hauled me around to alot of out of town meets.(thanks). before those guys there were dave and dan ransom. Ralph…good to see you are still around…and remember Bill and me… and the Ransom Brothers! I remember Ralph. Good to see your name. Those were good days. I will remember them forever. 1967?! Jezzz, that long? Oh so that’s when the Bunny Bread got popular? I don’t know but the bread nowadays goes stale easily. What do you think is the reason? First of all, I want to say how much I have enjoyed looking at your blog. I originally hailed from Sikeston and went to college at Southeast Missouri State from 1983-1987. I had Mr. Mosley as a World History instructor during my sophomore year at Sikeston High School. Even though I am younger than you and the commenters, I have enjoyed the photos and stories behind them. I can remember being a small child in the car coming back from a trip and seeing the Indian at the War Drum greeting us as we made our way home. I also remember seeing him adorning Houck Stadium. I think it’s a shame that the university didn’t keep him as a mascot. I look more upon it as keeping the proud heritage alive as some of our ancestors took Native American women as spouses. I certainly think that the portrayal of Chief Sagamore is much more politically correct than the ridiculous and insulting caricature of Rowdy Redhawk. 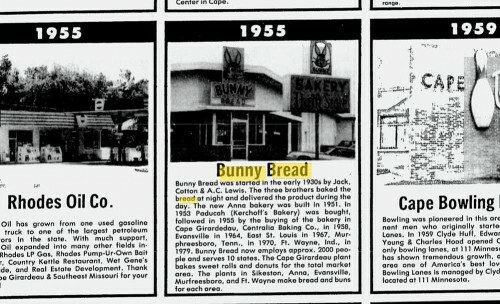 I worked at the Bunny Bread Bakery at Sikeston for a time as well, so I suppose it demonstrates that it truly is a small world after all. It closed shortly after all of these other closings mentioned.I suppose that I might be heavily scrutinized but I felt compelled to answer Samsung’s question. Flour comes in different grades like so many other things. Like many other businesses, they felt that it was better to put out a product as cheaply as possible. (Quantity over quality) They simply weren’t making the money they desired so they closed these bakeries around the area along with eliminating many union wage salaries. I can honestly say that I learned a lot from working there. These include: Some people are no longer satisfied with making a healthy profit margin. If they cannot literally make a killing, it is not worth creating a product or doing business. The other lesson is that white bread is very unhealthy because bleaching flour strips it of nutrional value. You are better off baking your own or investing in a bread machine. It will be healthier and taste so much better. Young whippersnappers are allowed here. When my kids were in Scouts, we adult leaders instituted an R-Rated rule for our dining tent after lights out – nobody under 17 admitted. We weren’t doing anything R-Rated, we just didn’t want to be bothered by any kid not in need of medical attention. We have no age restrictions here. Oh geez I remember Bunny Bread from when I was a kid. Great website you have here, brought up some good old memories. Where can I get Bunny Bread tshirts? I got mine when the store was still there. I don’t know. My dad used to work at a BB Bakery in Fergus Falls, MN back in the 60’s and 70’s before it was bought out by METZ Bakeries. My two brothers worked there full time and I did some part time work. Lotsa memories. Looks like Lynn Davis McClain the center girl in the beard selling picture. Just saw it today! Glad you enjoyed the post. Unfortunately, I have no connection with a bread company except as a consumer of a gazillion pieces of cinnamon, sugar and peanut butter toast when I was a kid. I remember doing Bunny Bread commercials for Daddy at KFVS! Good times, I made $15.00 per. That’s what I said. Bunny Bread! The “used bread store” makes me think of The Cape Beauty School, where my mom always took me for cheap haircuts. Anybody else remember that? Lewis’s knew the value of a dollar and squeezed every nickle twice before letting it go. In the late 70’s when I was doing voice overs and commercials I did a series of character voice radio spots that aired for several years. I didn’t understand session fees, buy outs, etc. in the beginning and just did the work and charged a fee. Then later I joined the union – AFTRA/SAG and all talent fees were on a very structured schedule based on hours, use, renewals etc. Suddenly 20 years after the fact I start seeing some (rather simplistic) cartoon commercials for Bunny Bread airing in the Midwest with my voice overs. I had no contract to fall back on so just let it go with humor and it continued for at least a couple years. They got their money’s worth. Agree! My uncle, Bud Bollinger worked for them for many years.. He retired from there.. He and Jack Lewis were friends..
Jack lived in a cabin style house with a big pond between Anna and I-57, if I remember right..